As the story goes, Box-Car Bertha was a young woman transient of the 1930s who made her way through life as a prostitute, a thief and a murderer. In 1972, Martin Scorsese captured the life of this character in his film, Box-Car Bertha, staring Barbara Hershey and David Carradine. The film is an adaptation of Dr. Ben L. Reitman’s autobiography of Box-Car Bertha, “Sister of the Road.” Reitman’s story, however, was actually a composite of women he knew in the 1930s, women who “road the rails” and lived by any means in order to survive. These women, and their male counterparts, had compelling reasons for leaving their homes, they were hopeful of finding a better life elsewhere. They shared an identity with others who they met on the road. No matter where they landed or who they met while traveling, they shared a common culture, they proudly called themselves Hoboes. Today, the term hobo often conjures up romantic images of men and women from another era who traveled the country in empty boxcars, unimpeded by worldly goods and pressures, enjoying a life of freedom and independence. I remember as a kid in the 1950s that dressing up as a hobo was one the most popular Halloween costumes; torn and patched old pants and jacket, floppy hat, charcoal or black smudges on the cheeks, and a stick over the shoulder with a handkerchief sack tied on the end. Little did I know of the men and women who actually were Hoboes, traveling by train and living in “jungle” camps. This historical image is seldom seen in today’s healthy economy, but back in the Economic Depression of the 1930s, riding the rails in search of a better life was common. At the height of the Depression, historians estimate that 250,000 teenagers were transients, who hitched rides on trains, lived in “jungles” or hobo camps--all looking to go anywhere that was different from the impoverished homes they left behind. Most of the kids were not bums. Any good hobo worth his salt will tell you that bums did not work, they lived on handouts. But Hoboes, sometimes called tramps, traveled to find work, usually looking for agricultural work. It is believed that the term Hobo is derived from “Hoe-boy,” which described migrant farm workers around the turn of the twentieth century. Hoe-Boys often carried their own tools when they traveled, ready to be employed in any field needing attention. The Hobo culture goes back farther than the turn of the twentieth century and has it’s origins in post Civil War American South. After the Civil War, many who were homeless jumped on the trains for a free ride west to find work. These transients worked on farms, on construction jobs, on gas lines, or on the railroads, where they helped to open the American West. 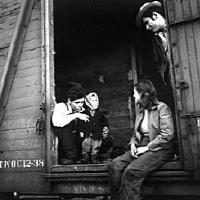 The stories of the children who left home in the 1930s reveal a complicated set of circumstance that forced them to seek shelter, support, and companionship from others who traveled the rails. Many of the young men and women who left home at an early age did so because of abusive parents and economic troubles, which added to their already uncertain futures. When “the big trouble came,” meaning the start of the depression, many who were on the bottom rung of the economic ladder suffered the most. The children living in the hobo jungles talked about their mothers having married five or six times, each husband treating the kids differently. They talked about drunken parents who took out their frustrations on their children, physically abusing them. And others talked about making the decision to leave home so it would be easier on the younger children, one less mouth to feed. On the road these kids met up with others in the same circumstances and with older men and women traveling the country looking for work. Together, they formed a family where they took care of one another. Some traveled together until a job or different goals separated them. But universally, they shared a common bond, and a support system. In their culture, they developed a unique set of symbols, a language that helped them to find work, to stay away from certain people, to find a place to stay or eat—information from one stranger to another that would help them to survive. Many of us today have relatives who knew the “freedom of the road. “ My father and uncle were young men when the Depression started. The Depression gave them an opportunity to try and find work in the West, a place the boys dreamed about while growing up on a farm in Indiana. They found work paving roads in Yellowstone National Park. When winter came, they hopped the train and went back to the farm. When the snows melted, they went west again, looking for work in the Parks or on ranches. They never recorded their experiences. Others, however, talked of their adventures as hoboes. Among those were Supreme Court Justice, Willliam O. Douglas (1889-1980) and folk singer and actor, Burl Ives. The era of the Hobo is over. It is estimated that today there are perhaps 200 such individuals. But, in honor of the culture, each year in Britt, Iowa there is a hobo convention attended by those who “hoboed earlier” in their lives, and by those who just appreciate the freedom symbolized by the Hobo lifestyle. The convention started in 1900 and this year it is estimated that it will draw thousands of visitors. There is a cultural legacy left by those who were down and out in the 1930s-- folk songs that captured the experience and culture of those who lived on the road. A “Hobo Lullaby” sung by Emme Lou Harris pretty much sums up the life and era of the Hobo.